Education boards have confirmed that almost 700 of Northern Ireland's statutory schools have been closed by hazardous weather conditions. Meanwhile, City of Derry Airport has re-opened and is operating normally. Flights have also resumed at Belfast International Airport and Belfast City Airport. Passengers, however, are asked to check before setting out. Ice and heavy snow continue to cause significant traffic problems. Translink said the weather was causing difficulties on a number of routes with the worst-affected areas being Armagh and Coleraine. 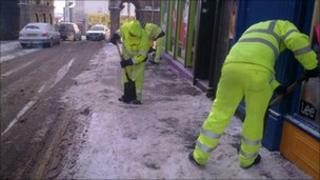 Roads Service has said they were working to hard to keep the main routes open. The Northern Ireland Ambulance Service (NIAS) said that in the interests of patient safety, it had cancelled transport for all routine and non-urgent appointments for Tuesday. It said the exceptions to this decision were cancer and renal patients "for whom every effort will be made to provide transport". The NIAS said it expected normal service to resume tomorrow. BBC NI weather presenter Angie Philips said the treacherous conditions were set to continue throughout Tuesday. "The heavy snow may have cleared away, but it has left a lot of lying and compacted snow and there's a severe weather warning for widespread ice, especially, but not exclusively, on untreated roads and pavements and over the now frozen lying snow," she said. "Further snow showers will develop towards the north coast and are likely to drift inland across parts of Londonderry, Antrim, Tyrone and maybe Fermanagh this afternoon, but Belfast, Down and Armagh should stay dry and bright. "However, across all parts it's a bitterly cold day with temperatures struggling to get above freezing in some inland areas."